Dawn Goddard CA on building a digital practice and the opportunities and challenges she has faced. Philip McNeill looks at the potential risks to ‘the cloud’ in 2018. NMW and Seafarers– new guidance or old rules? What, if anything, has changed following the government announcement of new guidance on National Minimum Wage and seafarers? 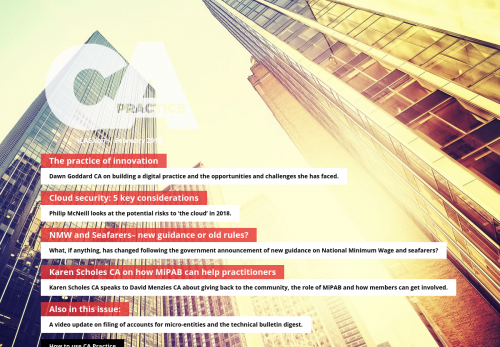 Karen Scholes CA speaks to David Menzies CA about giving back to the community, the role of MiPAB and how members can get involved. A video update on filing of accounts for micro-entities and the technical bulletin digest.